“The food we try to keep very simple, Italian, fresh, easy. Not overcook or spoil the product, this is very important,” insists Michael Perrotta, proprietor of arguably Penge’s most popular Italian restaurant — or perhaps just restaurant full stop. Come nightfall, Penge High Street is pretty much a ghost town, bar the inviting pub lights. But Friends of Flavours, located on Green Lane just past the old police station, is a shining beacon. Michael, along with chef Bruno Guidi, and a rotating crew of waitresses and waiters have made this restaurant not just a rare sit-down eatery in a sea of takeaways, but a destination venue that attracts customers from Penge but also Beckenham, Crystal Palace, Sydenham and beyond. Serving authentic and high quality Italian food with a Neapolitan flavour owing to Michael’s upbringing in the port city of Naples, assorted Napoli football team memorabilia decorating the restaurant’s walls, its focus on pasta, seafood and meat dishes — eschewing typical staples like pizza — differentiates it from the pack (and helpfully Sicilian Art down the road). What’s the history of the restaurant? You used to be in Clock House, right? So Friends of Flavours was a coffee bar to start with? 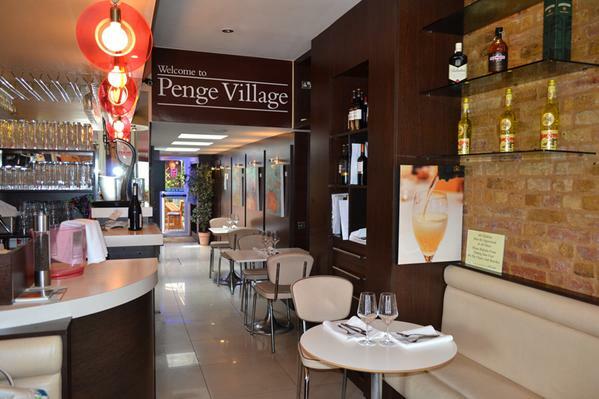 Why did you choose Penge for the new location of Friends of Flavours? What influenced your choices with the menu? Is it a particular kind of Italian cuisine? The restaurant is very popular. Have you been noticing it getting busier in the last year or so? So you think that Penge would be better with more independent businesses? What do you make of the pizza restaurant, Sicilian Art? You changed the menu recently, didn’t you? So you have an emphasis on fresh ingredients? Who else works for you? You’ve been doing well in the Time Out Love London Awards. If you win, what do you want to do? Writer and Penge resident Ben Murphy donned the bib and devoured the squid for the PTB. Love friends of flavours. Try to come as much as possible. Keep up the good work. It’s always delicious food and super friendly. I went to this restaurant for dinner on a Thursday night. From outside it looked good, and he environment inside was very warming. Everything was clean, no complaints from that point…Apart from a glass of white wine that was warm (which I made it cooler by putting the ice from my water), and everything looked okay. Well, this was until the food arrived…! First we order some calamari.. The calamari wasn’t properly fried, which was a disappointment. I asked for the dipping sauce for the calamari which the waitress said they didn’t have it… Well, I could have still eaten it without the sauce, however they were soggy. We paid the bill and we moved to a different restaurant, a really nice Sicilian pizzeria nearby, where we were very well welcomed. We told the staff about our horrible experience, and not they just laughed as they offered us for free (a big surprise), a full plate of seafood… amazing!! (And just to remember that the other restaurant refused to even remove the dish from our bill.. ) Well, we ended up eating the seafood, one pizza and 2 deserts from the Sicilian restaurant. If ‘Friends of Flavours’ would have been nicer, and more professional we probably would have stayed for desserts and coffee… but well, they thought £7 was worth it to make some customers unhappy… Well done! I have eaten at Friends of Flavours on many occasions, both in small and larger groups. The service can be a bit quirky but generally good & there is one fantastic waiter in particular. The food itself is amazing, its absolutely delicious!! & They have very nice wine too. I highly recommend this restaurant.